Tom & Ed met in history class at Manchester University in 1988. They started off as DJs known as "The 237 Turbo Nutters" (named after the number of their house on Dickenson Road in Manchester and a reference to their Blackburn raving days). They then opted for "The Dust Brothers" which they nicked from the L.A. producers of "Pauls Boutique" (as they thought they would never be famous). In 1995 they changed their name to "The Chemical Brothers" after the real Dust Brothers threatened to sue. think they'll ever release a compilation LP of all the Electronic Battle Weapons? I would like all their vinyls... Even The Singles. If only i had a record player. It was a love of dance and rock music that brought Tom Rowlands and Ed Simons together at Manchester University. Tom had enrolled to be nearer to Factory Records' fabled Hacienda nightclub, and Ed wanted to spend time in the city of his heroes?ûthe Smiths and New Order. This was the early nineties, a heady time for musical change in England. Emerging DJ's like Mike Pickering and Paul Oakenfold were coming back from their Ibiza holidays and trying to re-create the anything goes playlists they had experienced at clubs on the island. This blend of hip-hop, rare house, classic rock and just about anything else provided it worked became known as Balearic (named after the group of Mediterranean islands that include Ibiza). Tom and Ed loved the Balearic blending of genres and started their own similar night at local Manchester club, Naked Under Leather, in 1991. As this extra-curricular diversion grew in popularity, they took the name The Dust Brothers in tribute to the U.S. production team responsible for the Beastie Boys' Paul's Boutique, and started to produce their own music. Their first effort, "Song To The Siren" immediately put them on the map. Darren Emerson, Andy Weatherall and Lionrock's Justin Robertson all took notice and they soon found themselves in-residence in London as a production and remixing duo. Man, what happened to these guys? It seems that after they released 'Dig Your Own Hole', they abandoned their signature Big Beat sound and shifted more toward House and Electro with each album having a more crappy sound to it, for a lack of better words. And I hate saying it because I've been a fan of the Chemical Bothers since their inception. I remember they used to be one of the biggest names in the industry and had a cutting edge sound that no other artist could come close to touching. But then they released 'Surrender', and they've never gone back to the Big Beat sound. Now I know that the Genre has shifted and Big Beat isn't as popular as it was back in the mid to late nineties, but that is what put these guys on the map along with other artists such as 'The Prodigy' and 'The Crystal Method'. And again, I know it's not easy to put this kind of music together or to come up with it from scratch. It's just kind of sad to hear what these guys have become when it's compared to their earlier albums. Maybe they need to take some more chemicals again to get those creative juices flowing. Hey, just throwing that idea out there! "Further" is the finest Electronic album ever.Perfect.It will not be surpassed. Hannah is their best work. That is all, I'm a hudge fan but Hannah is in a different league to all their other stuff. Modular heaven. These guys have traversed so many sonic styles and landscapes, there's something for everyone. They invented the amazing genre big beat with the psychedelic, ground breaking Exit Planet Dust. They came back and perfected it with the dark, powerful Dig Your Own Hole. In terms of big beat, no one can top DYOH, not even the Chems. So when Surrender came along, (personally my favorite album) it threw the genre door wide open for the Brothers, setting them free to explore any music they wanted to. Over that threshold went Tom and Ed. The first album sent back through that gate was Come With Us. It was an experimental bird, with music of every color, shape, texture. Push The Button was in the same vein, although more commercial, exploring many styles they never touched on before, often aided by collaborations, while still managing to stay true to their roots. I don't exactly prefer either of these albums Chems-wise, but they do have some extremely great high points. After those two hiccups - small as they were - came We Are The Night, a top notch, well polished, and very detailed dance album - that has to be their most underrated work yet. "Overproduced house music". Bah! The culmination of these exploritative exploits came in the form of Further, their latest album released about six months ago. It's a lot more raw and unrefined than their most recent releases. But it's true Chemical Brothers. They went without any collaborations this time around - Tom actually sings on the tracks that have vocals (except Snow, where Stephanie Dosen provided her ethereal voice) - and it paid off. For the first time ever, we're hearing something once only found in their live sets: pure chemicals, nothing else. It's quite awesome. Now that they've almost done everything (except maybe a polka album), what's the next step? 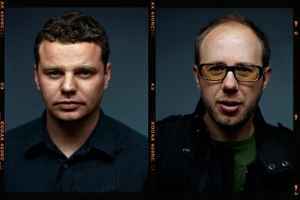 It looks like a movie soundtrack, as The Chemical Brothers have finished recording the score to 2011 movie Hanna. I'm really anticipating this, director Joe Wright says it's "there's lots of bass, it's very loud." Don't know about you, but that sure gets me excited. This is something totally different for The Chems, which shows that they're just as excited about making music and that they're not going to stop innovating any time soon. The trouble is that some people have difficulty accepting innovation. I can't believe how many comments, posts, reviews I've read saying "This is crap! Where did the block rocking beats go? I want another Dig Your Own Hole!". It's not going to happen. Sadly, Big Beat is dead, it's been gone for a decade now and I doubt it'll make a comeback anytime soon, as much as I'd love it to. But even if it was still going strong, I doubt the Chems would still be making it today. Their sound evolves, like all good artists do. They're explorers and pioneers and they write their own rules. So if you want more big beats, please don't call their new stuff 'crap'. You should go back and listen to some of the singles, b-sides, and better yet remixes from that era - they won't disappoint. Tom and Ed have been recording whatever the hell they wanted to for eighteen years now, blowing the minds of partiers and intellectuals alike. And they know what they're doing. They can make you feel, dance, sing, and experience things only music can bring. So respect the bros. It Doesn't Matter whether you can't stand anything past Dig Your Own Hole, love what they did with Push The Button and We Are The Night, jam to their entire back catalouge like I do, or are totally new to their music, you simply have to hand it to these pioneers of music. They've done it all. they havent made good music since their kylie minogue remix, which was like 2003. nonetheless, they are still one of the greatest artists on the strength of their older tracks.